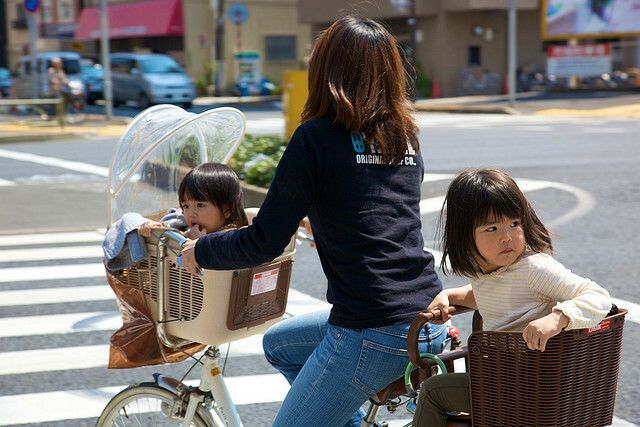 In the big cities, you’ll see a lot more mums transporting their kids by bike than by stroller. By the time a third kid comes along, the oldest one is usually big enough to follow on his or her own bike, but I have seen a mum carrying three kids on one bike – the third one being a baby carried in a sling on her back. This family is in Kita-senju in Tokyo. Overseas, Japan may be best known for its high-tech consumer electronics and its cars, but many visitors to Tokyo are struck by Japan’s extensive use of one much more humble technology: the bicycle. All over Japan’s modern cities bicycles are in evidence, and not even modern ones at that – most bicycles in Japan are heavy steel constructions with a single gear, and a basket on the front. Most foreigners wouldn’t be seen dead riding anything so uncool, but Japanese of all ages ride more or less identical bikes. 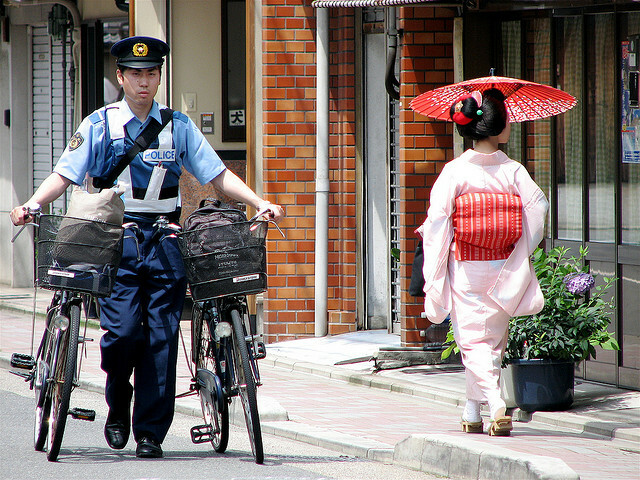 In Japan even the police rely on bikes as their main form of transport. This policeman is passing a Geisha in Gion, one of Kyoto’s geisha districts. Usually bikes are ridden only short distances, rarely further than the nearest station, and at a speed not much above walking pace. In Japan bicycles are just a practical means of transport, not a fashion accessory or a keep-fit device. Of course there are serious cyclists in Japan, who commute long-distance on state-of-the-art road bikes, or who go racing at the weekend, but they’re a small minority. You’re more likely to see a well-dressed middle-aged housewife or a businessman in a suit riding a bike than you are anyone wearing cycling shorts and a helmet. The bike park at Okazaki Station in Aichi Prefecture. 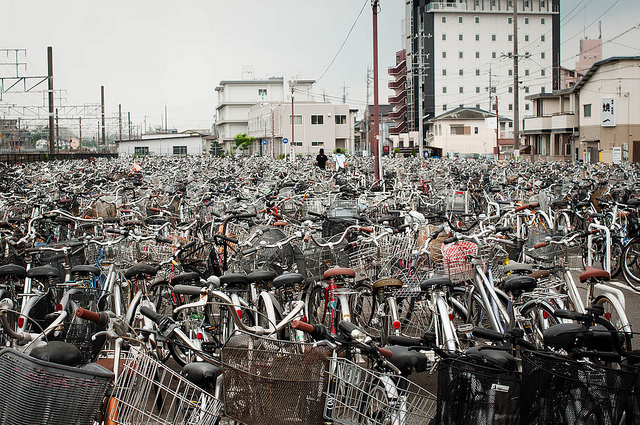 If you look closely, you’ll see that all the bicycles are ladies bikes, as in Japan bikes are gender-neutral: Both men and women both ride bikes without crossbars. Most apartment buildings and many stations have their own purpose-built bike-parks – the biggest of which can be multi-storey structures with space for thousands of bikes. Some modern shopping centres even have underground bike-parks that have a special conveyor-belt bike-lift to raise your bike back up to ground level when you leave. If you’re wondering why so many Japanese people ride bicycles, it probably all comes down to the crowded nature of Japan’s cities. There’s just no room to park cars, so if you don’t want to walk and there’s no bus or train, bike is the most practical option.